As fall arrives and school starts my attention tends to be on a few things, getting Hazel ready for school, getting clothes for the cooler weather and then I start to think about the upcoming events and holidays. Being Christians and having Hazel attend a private Christian school we do not pay much attention to the Jewish holidays, but there is Columbus Day and Halloween in October and Veteran's Day and Thanksgiving in November. This year I have Veteran's Day on my radar. The parent group at Hazel's school is planning a collection service project for the troops, so perhaps that is why. Last year I had the pleasure of reviewing Once a Shepherd by Glenda Millard and published by Candlewick Press as well. This book helped explain the sacrifices of the soldiers and their families. This year I am going to share with you Let the Celebrations Begin! : A Story of Hope for the Liberation by Margaret Wild and illustrated by Julie Vivas. 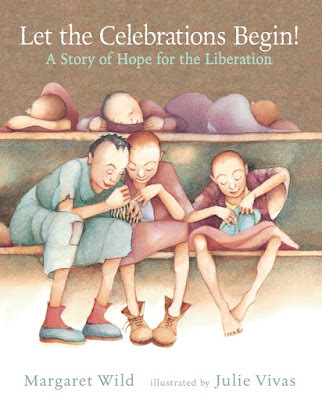 This book is a friendly way to begin a discussion for the first time with a child on World War II and the concentration camps. 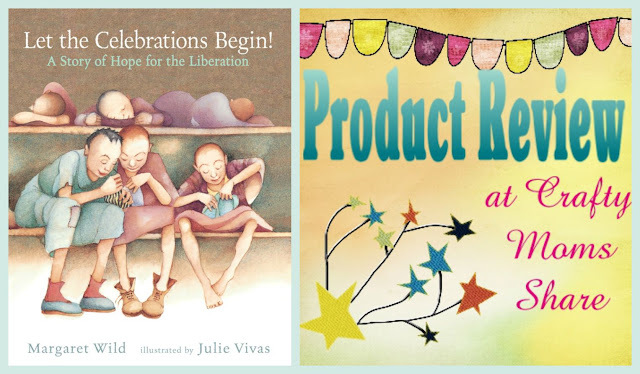 It is the story of how many of the women in the concentrations camps began using scraps of fabric or even cutting pieces from their clothes and bedding to make toys for the children to give them when they were freed. 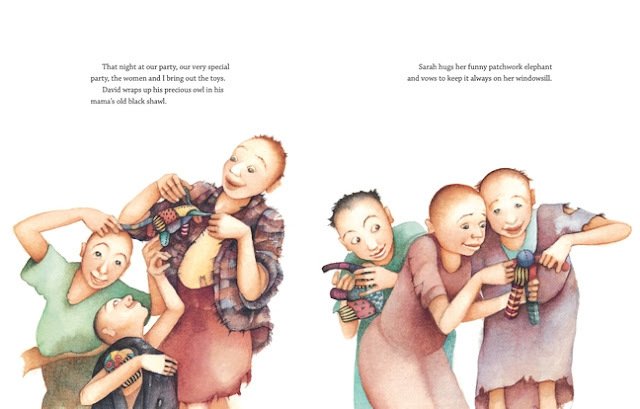 The narrator is an older child who remembers what freedom was like and the toys she once had and shares a bit of her past with the younger children who do no have the memories. She works with the women to prepare a celebration since they heard the soldiers were coming to free them soon. The story is not intended for really young children. I do not think I would read it to someone younger than Hazel. However it is a powerful tool to begin the discussions of the horrors that happened during World War II and how as a world we work to prevent anything like it from happening again. The illustrations are beautifully simple and heartbreaking. One can see how poor life was for them and how the simple joys of patchwork stuffed toys made with scraps from everywhere could make the children so happy after having nothing of their own. The story and pictures fit together so wonderfully and really provide a strong message. The story was created after Margaret Wild read a brief mention of the Polish women in Belsen made stuffed toys for the first children's party held after liberation. She read it in a book on antique toys. She made the story up from that brief piece of history. Liberation of Belsen Concentration Camp April 1945: Women and children herded together in one of the camp huts. This book shares a piece of scary history in a non-frightening way. The pictures one can find on-line like the one above show the more realistic and scary reality. This book provides a way to share a piece of the past in a manner that is serious yet fun. They were looking forward to liberation and were able to plan for it. It is a perfect book for anyone who wants to teach a bit of World War II history without scaring the students.